Climb into a canoe at dawn, paddle into the reed beds of Madagascar’s largest wetland, and with luck you could see a unique primate: the Alaotra Gentle Lemur (Hapalemur alaotrensis). Known locally as the bandro and described by Gerald Durrell as a “honey-coloured teddy bear”, these lemurs spend their entire lives within the cyperus and reed stems of the marsh around Lake Alaotra in Eastern Madagascar. The Alaotra Gentle Lemur is the only primate that lives exclusively within a wetland habitat. Photo credit Toby Nowlan. pounds. Their dense fur grows grey on face, chest, and ears; a rich brown on head and back. A long tail helps with balance on the floating vegetation of the marsh. The animals live in small territorial family groups, and, as is typical of many lemurs, females are dominant. “We currently estimate between 2,000 to 2,500 Bandro,” Lance Woolaver told mongabay.com. He is the head of Species Conservation and Research at the Durrell Wildlife Conservation Trust (Durrell) Madagascar. Durrell initiated some of the first studies of the bandro in the early 1990s. “Research showed it was endangered and completely dependent on the remaining marsh,” Woolaver said. Back then, the population was estimated to be 11,000 – they have declined by almost 80 percent – and hunting for bushmeat was their greatest direct threat. In an attempt to curb hunting, Durrell reached out to the local people, holding environmental festivals to “engage local communities, discuss the importance of the marshes and demonstrate the uniqueness of the lemur to Alaotra.” This outreach was successful, with habitat loss and fragmentation – which isolates groups of bandro – now overtaking hunting as the biggest problem facing the species. Jonah Ratsimbazafy, Secretary General of GERP (the Madagascar Primate Group) started working to conserve the bandro in 2003, and still remembers his first encounter of the bandro in the wild. “The first individual/group we saw… for me, was like discovering a diamond,” Ratsimbazafy told mongabay.com. A young Alaotra Gentle Lemur. Photo credit: Arnaud De Grave. The Alaotra wetland is at the heart of Madagascar’s “rice bowl” region, which produces a third of the national rice harvest. The lake is also a nationally important freshwater fishery. “The Alaotra was once the biggest inland fish supplier, but these stocks are now imperiled,” Waeber explained. In a country of extreme poverty these natural resources are vital in the deepest sense of the word. 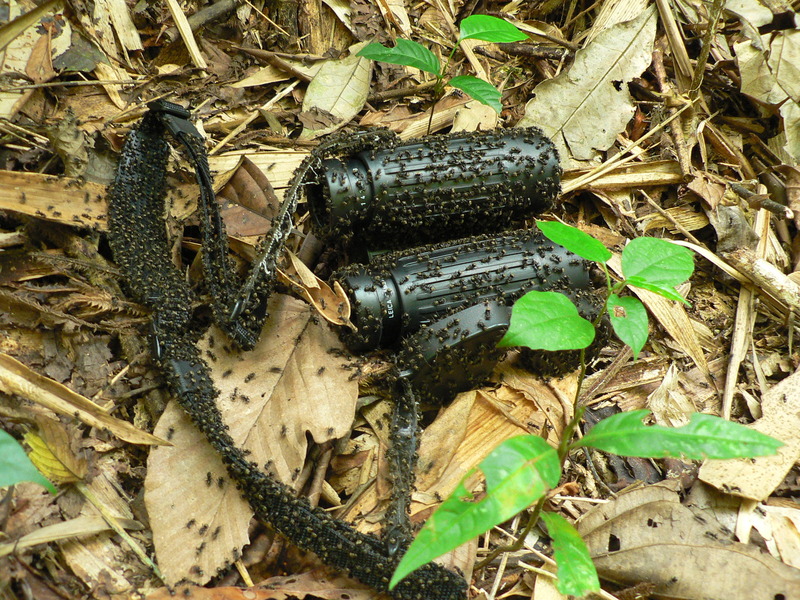 But exploiting them has a major impact on Alaotra’s biodiversity. Alaotra’s ecological importance is not limited to the bandro. Numerous rare and endemic species inhabit the wetland, including Meller’s Duck (Endangered), and the endemic Madagascar Rainbowfish (Vulnerable). Others have already vanished, such as the Madagascar Pochard (Critically Endangered) and the Alaotra Grebe, which was declared extinct in 2010. But even as these species struggle for survival, startling new discoveries are being made. In 2004 researchers realized that an aquatic, mongoose-like mammal observed swimming in the marshes was unknown to science. Formally described in the same year that the Alaotra Grebe’s extinction was confirmed, Durrell’s Vontsira (Salanoia durrelli) was the first new species of carnivorous mammal to be discovered in 24 years. And that’s not all. “There is also an undescribed species of mouse lemur probably unique to the marshes of Alaotra,” Woolaver said. A live-trapped Durrell’s Vontsira just after release. Photo credit BioCensus. So far, little is known about the cat-sized Durrell’s Vontsira. It has physical adaptations to its aquatic habitat such as enlarged paws, which distinguish it from its forest-dwelling relative, the Brown-tailed Mongoose (Salanoia concolor). Knowledge of its population – estimated at fewer than 465 individuals – and its behavior is gradually accumulating thanks to weekly marsh patrols established by Durrell to monitor the bandro, the Vontsira, and illegal activities. “Camera-trapping and live-trapping have also been trialed and work well with this species,” Woolaver added. With such low population densities, seeing either the bandro or the Vontsira in the dense marsh grasses requires a great deal of luck. What are the chances, then, of witnessing an interaction between two of the rarest mammals in the world? The global significance of Alaotra’s biodiversity was recognized in 2003, when the entire 722,500 hectare (2,790 square mile) watershed was designated a Ramsar site – recognized under the Ramsar Convention, an international wetland preservation treaty. In 2007, with the help of Durrell and other NGOs, the region was afforded further protection by the creation of a community-managed New Protected Area. “Despite these protective designations, burning for conversion to agricultural land-use (i.e., rice production) is steadily and rapidly reducing the amount of potential lemur habitat,” Waeber said. About 6 percent of marsh habitat is lost every year. Durrell’s Vontsira, formally described in 2010, was the first new carnivorous mammal to be discovered in 24 years. Photo credit Lance Woolaver. Durrell’s early efforts to engage local communities provided the foundation for community-based management of the marshes. Durrell was instrumental in the establishment of 28 community associations which now manage 90 percent of the 23,000 hectares (56,834 acres) of marsh that remain. A pioneering participatory ecological monitoring project was also developed, which provided communities with improved education, food security and access to clean water. “This program collected distribution data on biodiversity, and also improved relationships with local communities and encouraged them to protect the marsh,” Woolaver said. Alaotra Gentle Lemur. Photo credit: Alice Smith. “In order to do this we do need significant levels of engagement and long-term financial support from major development organizations and donors,” Woolaver said. Weekly patrols monitor endangered species and illegal activity in Alaotra. Photo credit: Durrell. On the eastern shore of the lake, near the town of Andreba, lies Parc Bandro, a protected area of 80 hectares (198 acres) managed by MWC. “With the consent of the community, we have built Camp Bandro to allow visitors to stay overnight, [and] to be at the lake and in the marshes by sunrise. This is the prime time for lemur watching,” Waeber explained. MWC has also been looking to the future. Training the next generation of Malagasy conservationists is a priority. Working in collaboration with both Durrell and GERP, MWC will enable 10 Malagasy students to undertake Master’s research on the bandro’s ecology and conservation. Celebrating World Environment Day in Alaotra. Photo credit: Durrell. 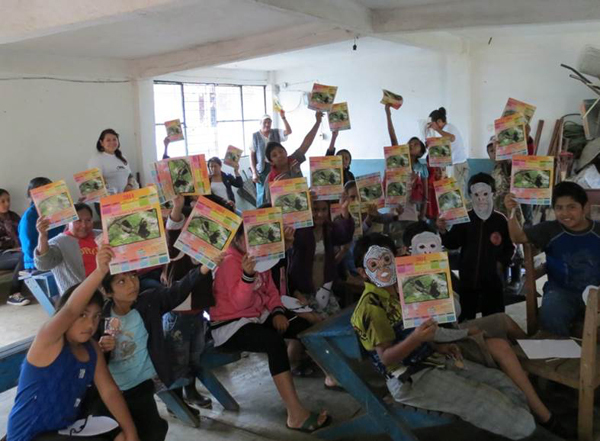 An environmental education program aimed at primary school children and teachers has also been developed, with 3,000 comic books entitled Arovy fa harena (Protect because it’s worth it) distributed to schools so far. “The children experiencing environmental education are clearly more aware of the lake biodiversity,” Waeber said. Increasing engagement with local communities is crucial, but they alone will not determine the fate of the Alaotra. Much of the destruction of the marsh is driven by people outside the region. “Lack of law enforcement has led to land-grabbing by powerful people, most of whom are not even from the local communities around Alaotra,” Woolaver explained. “That is why we try to find ways to empower the local communities,” Ratsimbazafy said. Furthermore, he thinks the law should be applied equally to all. Reeds in the Alaotra marshes, habitat for the Alaotra Gentle Lemur and Durrell’s Vontsira. Photo credit: Lance Woolaver. “The two species can be saved from extinction, it isn’t too late by any means,” Woolaver concluded. “All of the knowledge, experience and techniques have been developed and are there to save the bandro and Vontsira, but a major concentrated and integrated effort requiring financial support will be required.” And if these flagship species can be saved, the rest of Alaotra’s biodiversity can be saved alongside them. Alaotra Gentle Lemurs are threatened by the loss of their wetland habitat as it is burned to make way for rice fields. Photo credit Toby Nowlan. There’s a tropical rainforest tucked away in a giant bubble in the south west of England. The Eden Project transformed an old china clay pit in Cornwall into a biological wonder, with huge domes enclosing the ‘world’s largest rainforest in captivity’ and a Mediterranean biome, surrounded by vast landscaped gardens. I can vouch for the rainforest experience, with the heat and humidity, lush vegetation (16,000 plants, 1100 species), and high canopy (reaching up to the top of the 50m high dome) almost perfectly recreating a tropical rainforest. The only thing missing being a legion of mosquitoes and ticks to drive you crazy. The Eden Project is a hugely popular tourist attraction, but it is also a charity that runs a range of social and environmental projects locally and globally, undertakes research, and teaches hundreds of school children each year through their range of workshops. I was delighted to be contacted this week by a member of the Eden Project education team, as they wanted to use the research and field experiences from this blog in their ‘Rainforest Rangers‘ workshop for 7-11 year olds. It sounds like a lot of fun! Sloths popped into the news a while ago, as one of the mysteries of their behaviour – why, once a week, they climb down from the canopy to poo on the ground – was examined in a new paper. Sloths are known for their leisurely lifestyle in the treetops, but there is more to them than meets the eye. A complex mini-ecosystem involving moths and algae may help keep the sloth both camouflaged and fed, and be the cause of their odd weekly habits. Pieces in the New York Times and National Geographic explain it all. Sloths popped up again yesterday. Did you know what noise a sloth makes? This interview was carried out for the environmental news website Mongabay.com, you can read the original here. 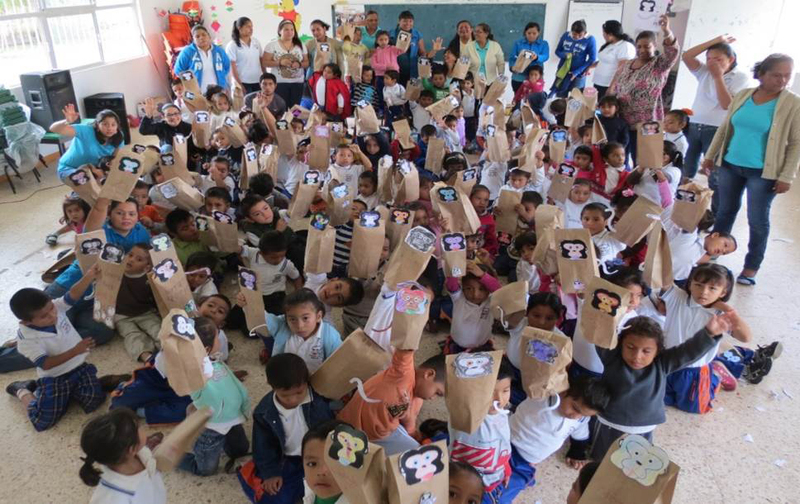 For conservation initiatives around the world, community involvement is often crucial. An additional challenge is how to conserve species once their habitats have become fragmented. 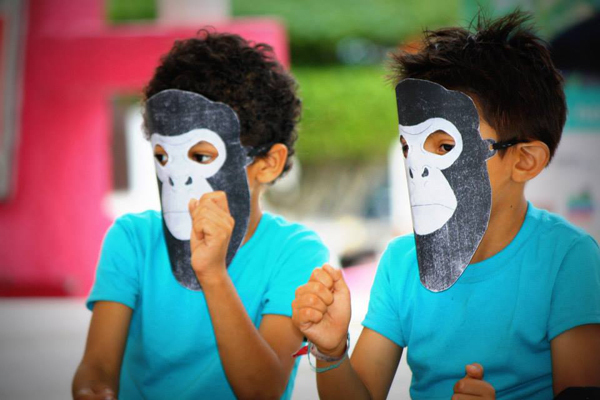 A primatologist in Mexico is bringing these together in a celebration of a Critically Endangered primate species: the Mexican black howler monkey (Alouatta pigra). Juan Carlos Serio-Silva, of the Instituto de Ecología, AC (INECOL) – Xalapa, Veracruz, and the Estación de Investigación Primatológica y Vida Silvestre – Balancán, Tabasco, has worked with Mexican primates for 25 years. In 2013 he was part of a team that not only helped to secure the establishment of a protected area for the Mexican black howler monkey, but also engaged local communities in a week of festivities, dubbed the First International Black Howler Monkey Week. 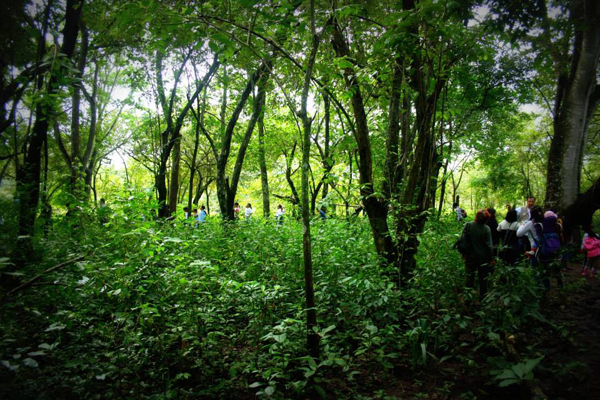 Here thousands of locals participated in workshops, tours, educational efforts, and reforestation activities. Two students enjoy their masks during Monkey Week. Photo courtesy of Juan Carlos Serio Silva. In an interview with Mongabay.com, Serio-Silva shares his experiences from decades of primatology research, habitat restoration and connecting communities with conservation. The students show off their work during Monkey Week. Photo courtesy of Juan Carlos Serio Silva. Juan Carlos Serio-Silva: My initial studies were a biology degree, and later I undertook a Master’s in neuroethology and a Ph.D. in ecology and natural resource management. In all research projects my main interest was to understand holistically the biology of wild primates, so during the Bachelor’s degree I understood aspects of primate behavior, during the Master’s I was working on aspects of their physiology, and finally during the Ph.D. I was looking to identify the role that wild primates have on the dynamics and regeneration of tropical forests. Mongabay.com: How long have you been working with primates in Mexico, and what is the focus of your research? Juan Carlos Serio-Silva: I started to study primates in the forests of southeastern Mexico in November 1988, so at this point I have a little more than 25 years studying wild monkeys and hope to have many more to continue “assembling the puzzle” of the biology of these fantastic animals. Currently, the main objective of our research team is to identify the way in which Mexican primates (black and mantled howler monkeys and spider monkeys) adapt behaviorally, ecologically and physiologically to the serious problems of habitat fragmentation. Thus, our research includes working with monkeys in several projects, for example: a) aspects of nutrition and food selection in different strata of the fragmented forest, b) exposure of wild primates to emerging diseases, c) parasite incidence and exposure to heavy metals, d) loss of genetic diversity by fragmentation of the environment, and e) the use of probiotics for the maintenance of captive animals and subsequent release of wildlife, among others. The students explore monkey habitat during Monkey Week. Photo courtesy of Juan Carlos Serio Silva. People in local communities are also working hard, and we try to support them in projects that seek to restore habitat to help these primates by placing trees between the habitat fragments to achieve future connectivity. While the trees grow, we have placed a suspension bridge so that monkeys do not have to go down to the ground where they are attacked by dogs or coyotes. We have also worked with women in the communities who have developed crafts related to monkeys and are now obtaining an economic benefit from these activities. We frequently run different workshops for children to learn about the importance and value of the primates living near their community, and in each workshop “guardians of monkeys and jungle” are appointed to ensure greater commitment to conservation. Of course, all these activities are not performed by a single person, but involve a team of colleagues and students participating with great joy in these activities. Also funding agencies like the National Geographic and the National Commission of Natural Protected Areas of Mexico (CONANP) who funded the PROCER supports the development of these projects. Mongabay.com: What are the main threats facing these primate populations? individuals hunting in some places for consumption as bush meat. Wild monkeys are extremely sensitive to the alteration of their habitat and although they have good behavioral flexibility to temporarily adapt to these changes, the reality is that we are slowly beginning to see their populations affected by isolation and by exposure to events and risks that were not present before (e.g., illness or deaths from collisions on the roads). In many places, these monkey populations are doomed to extinction and that is why in our research we seek the best strategies (academic and social) to mitigate these events. Mongabay.com: Some steps have recently been taken to safeguard habitat for one Critically Endangered species – can you tell us about the “Sacred Sanctuary of the Black Howler Monkey”? A fortunate thing is that as well as government representatives of the municipality, we also had excellent support from environmental representatives of Tabasco State Government (SERNAPAM) who supported this proposal from the beginning. With all these initiatives, the idea is to work together with projects to improve the conservation and restoration of habitat and living conditions of these black howler monkeys (maybe with more protected-reserve areas), besides bringing academic tourism projects where local people can support students or researchers to show the location of populations of primates. The students hard at work on their art projects during Monkey Week. Photo courtesy of Juan Carlos Serio Silva. Mongabay.com: You recently organized the First International Black Howler Week in Balancán, Tabasco; what did this involve, and what kind of impact did it have? Juan Carlos Serio-Silva: As part of the celebration for the declaration of Balancán, Tabasco as “Sacred Sanctuary of the Black Howler Monkey,” our research team developed a great festival called the “First International Black Howler Monkey Week” with the support of local authorities, state and federal government (SERNAPAM and PROCER-CONANP respectively), local schools, and communities near the sites where these primates live. A representative of the Primate Education Network (PEN) , an international organization for primate conservation educators, also participated. This event was held in the month of November and in the future it will be held every year in the town. Among the main activities that took place in the Central Park of Balancán village were: popular lectures given by the students and teachers who have worked on the study site and who have come from Mexico, Colombia, France, Spain, USA, etc. Also, during afternoons and evenings several primate related workshops were offered simultaneously, for children and adults in the same place, such as exhibitions of primate handicrafts made by people in the community, cultural activities such as dancing, singing, poetry, theater, a mural was painted and movies (all primate related) were offered for all the people who were learning about the black howler monkeys and other primate species that exist in Mexico and the importance of preserving tropical rain forest. 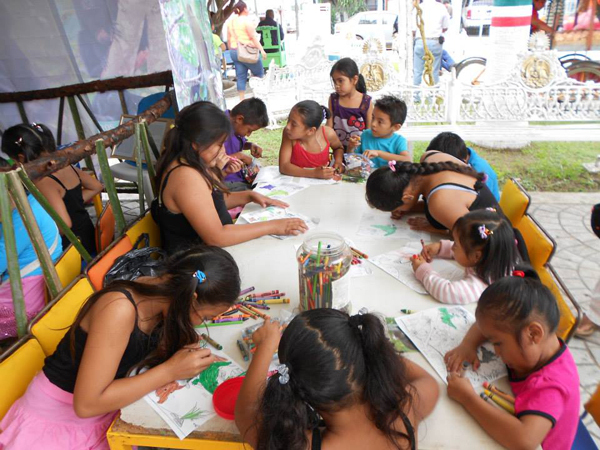 During each morning, the main activities were workshops in kindergarten, primary, and high schools across the Municipality of Balancán. Besides this, we established guided tours to explain to visitors the various aspects of the biology of these primates. This was done in the fragments of vegetation that our black howler monkey populations inhabit in the area of “Primatological and Wildlife Field Station Research” located on the Rancheria Josefa Ortiz de Dominguez in Balancán, Tabasco. During such visits, the children had the opportunity to ask about any information that they wanted to know about behavior, ecology, and physiology of these animals and after this they were involved in an activity called “Give a tree gift to the howler monkey,” where each child planted a tree to help to establish forest corridors between fragments and in the future monkeys do not have to get off the ground exposing themselves to risks. In sum, during the week of activities we had the participation of 3,000 – 4,000 persons who learned about the importance of the monkeys directly from the researchers who studied them in the field. Mongabay.com: What do you see as the most urgent conservation action that needs to be taken for the species that you work with? Juan Carlos Serio-Silva: There are different options to increase the chances of preserving Mexican primates and their habitat. But probably the most important and urgent activity is to promote more environmental education in all places where scientific research is conducted. It is very important to spread the value of wildlife (including primates) and the forested areas where they survive. Besides these actions, we must perform restoration programs to develop vegetation corridors between forest fragments, which connect areas to help animals without having to go down to the ground exposing themselves to predators or be infected by diseases. These activities also provide temporary jobs for local people and will increase understanding of the value of preserving forested habitat on their properties and ranches. We think that the link between researchers and leaders at all levels should be strengthened to propose sustainable alternatives and follow the “progress” without destroying the habitat of the species. One example of this should be ensuring that road construction companies create “wildlife crossing roads” to help avoid the many deaths caused by vehicles. In several local sites, health authorities should also conduct sterilization programs for dogs on ranches where there is an incredible overpopulation of individuals. These animals are predators of many species of wildlife, and at the same time these dogs could be vectors for many diseases in the human-environment-primate interface. Finally, the most important thing in all these different conservationist approaches is the organization with all people involved to try to include their interests and reconcile with the value of a better life for the future. This better life may only be obtained by combining productive activities with low impacts on the environment and restoration strategies for what is currently degraded. Mongabay.com: What are your plans for future research? Juan Carlos Serio-Silva: After devoting more than half of my life on this planet to study wild monkeys, many times I felt that there is something we have not done well, because forests are still being altered and primates are ever more threatened. When I meet many people in the local communities it seems that the reason for this unfortunate situation is that we had not been working together, and during many years many researchers around the world forgot the responsibility of teaching local communities and people involved in government offices about the importance of conserving the environment and primary species in the tropical forest like wild monkeys. Instead, some scientists said it was not their responsibility, and didn’t return to the communities where they studied, and failed to provide information on the flora and fauna in the local language. My plans for the future are much more than just undertaking more traditional research with Mexican primates. I wish that every moment I will have to do my research always involves a component of education and conversion of habitat degraded to habitat restored. We cannot be only spectators but we must act, researching, protecting, and restoring. Only then will our primate diversity and communities be able to live in harmony.